WinX DVD Ripper is a free DVD rip software to back up DVD movies to computer. This software can copy movies from DVDs and store in the computer or convert to different formats. WinX DVD Ripper can convert videos for iPhone, iPad, Apple TV, popular Samsung and HTC android mobiles etc. Now carry your movie collection wherever you go and watch movies on your Tablets or mobile phones. WinX DVD Ripper can rip movies from copy right protected DVD and it can remove region code from DVDs. WinX DVD makes the task of ripping DVD movies to computer a lot simpler. It supports hyper threading technology, Intel’s MMX-SSE & AMD’s 3DNow technology for fastest performance. You can even select the number of processors which will be used by the software. It can support up to 8 CPU cores for super fast performance. 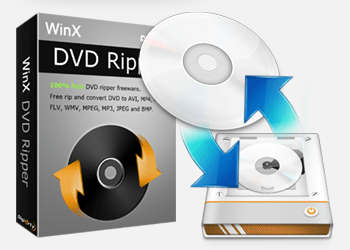 WinX DVD Ripper is a very easy DVD rip software. First insert the DVD into computer and load into the software. Now you can either copy the movie from DVD and save to computer or convert the DVD movie to different format. WinX DVD Ripper can copy entire DVD and save it as a single .iso format or as a single MPG file. It can convert the DVD movie to different formats like AVI, MPEG, WMV, FLV, MOV, 3GP etc. It allows to select the resolution, audio and video bit rate, video frame rate etc in every video format. The most useful feature of this DVD rip program is the ability to convert videos for Tablets, mobiles etc. It can directly convert compatible videos for popular devices like Apple iPhone, iPad, Android mobiles from Samsung and HTC, portable gaming devices like Sony PSP etc. There are two different version of WinX DVD Ripper- Free edition and Platinum edition. The DVD rip freeware editions offers basic DVD ripping functionality and Platinum edition has many advanced features. WinX DVD Ripper Platinum Edition costs $35.95. I’ll recommend you to first download and test the free edition before purchasing. WinX DVD Ripper works on both 32bit and 64 bit version of Windows XP, Windows Vista and Windows 7. I have using WinX for a long time. It has lots of advantages…really easy to use ripper.